Reality is dynamic. In fact, dynamics is so essential to reality that a static world is difficult to imagine. Space and time penetrate physical, biological, social, and humanistic inquiries. The accumulative nature of sensing and knowing our world arises through spatiotemporal experiences and interpretations. Some disciplines, such as geography and landscape ecology, emphasize the spatial dimension of world knowledge, and other disciplines, such as history and climatology, take timecentric approaches to organize evidences of reality. 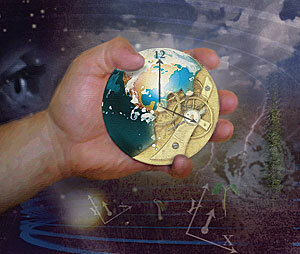 However, it is the space-time integration that provides the explanatory power to understand and predict reality. In this article, I advocate for the concept of dynamics GIS to fundamentally rethink the role of geographic information science as a means to improve our understanding of reality and, through that understanding, to develop geographic information systems that enhance our ability to formulate interpretations, make informed decisions, and develop adaptation strategies for this ever-changing world. Before continuing, I would like to clarify my use of dynamics GIS instead of dynamic GIS. The emphasis refers to the fact that a GIS can represent, analyze, and model geographic dynamics, not that a GIS is dynamic. 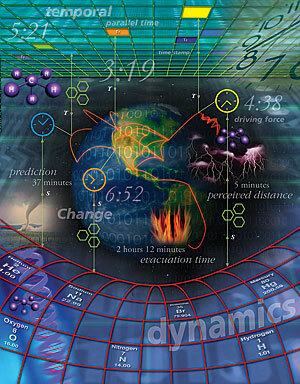 Dynamics is by definition an integration of space and time. Hence, let me start with a brief history of research that integrates time with GIS. The development of temporal GIS in the late 1980s marked a significant period of GIS research in dynamics. The importance of capabilities to handle temporal information in GIS has long been recognized by the GIS research community. I consider 1988 as the year that temporal GIS research took a significant leap with Gail Langran and Nicholas Chrisman's article "A Framework for Temporal Geographic Information" in Cartographica and Marc Armstrong's presentation on temporal GIS at the GIS/LIS international conference. Soon after, in 1992, Andrew Frank, Max Egenhofer, and Reginald Golledge chaired the National Center for Geographic Information and Analysis (NCGIA) specialist workshop entitled Time in Geographic Space and Methods of Spatio-Temporal Reasoning in GIS. In 1994, two publications laid the conceptual and computational foundations for temporal GIS development: Donna Peuquet's article, "A Conceptual Framework for the Representation of Temporal Dynamics in Geographic Information Systems," in the Annals of the American Association of Geographers, and Michael Worboys' article, "A Unified Model of Spatial and Temporal Information," in Computer Journal. Several academic publications review the development of temporal GIS. Most research efforts emphasize the integration of temporal data into GIS databases. Change and movement are two fundamental elements in temporal GIS research. Several temporal logic and reasoning schemes have been proposed. Research also discussed different kinds of time (e.g., world time and database time) or different topologies of time (e.g., cyclic time, branching time, and parallel time). Starting in the mid-1990s, temporal GIS researchers made laudable progress toward the development of spatiotemporal representation, data models, and query languages (e.g., the event-based spatiotemporal data model, field-based temporal GIS, object-oriented temporal GIS, event modeling language, and Arc Hydro data model). Recently, major progress has been made in modeling moving objects, spatiotemporal analysis, and geostatistics, as well as in visualization and geocomputation, especially agent-based modeling. Outcomes from these research efforts are being realized in various research-grade or commercial software programs, such as 4DataLink, Arc Hydro, EMBLib, GeoTime, STARS, STEMgis, Tempest, TerraSeer, and TimeMap, just to name a few. Temporal GIS research has prospered in many applications, such as map animation; change detection; movement tracking; and spatiotemporal clusters, simulation, and visualization. A later emphasis on processes and events set forth the basis for a dynamics GIS to reveal the causes or driving forces responsible for change and movement and the mechanisms by which the change or movement proceeds. After all, change and movement are observable elements of dynamics. If there is no change or movement, we would not be able to perceive dynamics. However, change and movement alone only partially address dynamics. Components, functional relationships among components, driving forces, and feedback mechanisms are all essential to understand dynamics; therefore, the concepts of a system and system dynamics constitute the foundation for dynamics GIS. Change to one component is likely to subsequently affect other components in the system. Movement of an element may induce adjustments to the positions of others. Dynamics GIS considers space-time integral to developing representation and methodology that treat reality as a system of systems cascading across scales of geographic dynamics. So what will a dynamics GIS be like? Since dynamics needs to be investigated from a system's perspective, we should first ask what a system is and then how system concepts can be embedded in GIS data and analysis. Let's look at system from the perspectives of general system theory and Ludwig von Bertalanffy's paper entitled "An Outline of General System Theory" published in the British Journal for the Philosophy of Science in 1950. He highlighted some general conceptions and viewpoints that cut across multiple disciplines, including wholeness, isomorphism, and orga-nization. Now it is common knowledge that the whole can be greater than the sum of its parts. The conception of wholeness is in fact a different, yet complementary, perspective to the reductionist's approach to understanding phenomena by dividing a phenomenon into individual elementary units and examining these elementary units and their interactions individually. The conventional GIS framework is more or less a reductionist's approach by resolving geographic phenomena into feature classes of elementary units (what may also be called geospatial data objects) in the forms of points, lines, polygons, and their attributes. Furthermore, the geometric characteristics or attributes of these elementary units remain the same regardless of whether they are investigated in isolation or in a complex. Reality is that an urban complex cannot be fully understood by merely examining its communities individually; also important are the spatial and social organizations among and within its communities and their social interactions and functional dependencies. General system theory emphasizes that the whole is not a simple summation of elementary units and is governed by dynamical laws. Isomorphism denotes that dynamical laws can be isomorphic (i.e., applicable across systems in various domains). I was fascinated when I first learned about field- and object-based conceptualizations in GIS and was able to make an analogy with the field and particle views of light in physics. Small-number simple systemsThe behaviors of elementary units can be accounted for individually by mathematical means or qualitative descriptors. Examples are the solar system and a class of students. Large-number simple systemsCollective characteristics can be considered through statistics. The large number of elementary units in a system ensures that statistical parameters (means, variances, etc.) are representative of general characteristics in the system, due in part to central limit theory. That is, when we collect a large number of independent observations from a population, the means of independent samples from these observations (which are also representative of the population mean) will approach a normal distribution. Examples are the heights of individuals and the property values in a region. In these systems, phenomena are sums of a large number of independent random effects and hence are approximately normally distributed by the central limit theorem. Middle-number complex systemsThe number of members is too small to make statistical measures representative but is too large to account for individuals. Therefore, middle-number complex systems require attention to members both individually and collectively. Hierarchy theory is a subsequent development of General System Theory to address middle-number complex systems in which elementary units are few enough to be self-assertive and noticeably unique in their behavior, and meanwhile, these elementary units are too numerous to be modeled one at a time with any economy and understanding. Echoing von Bertalanffy's emphasis on organization, Herbert Simon argued in his 1973 paper, "The Organization of Complex Systems" (in H. H. Pattee, ed., Hierarchy Theory, pp. 327. New York, NY: G. Braziller), that any complex system in the world must be hierarchical; otherwise, we would have no way to acquire and understand it. He further elaborated on the importance of hierarchical structures to the sustainability of a complex system, for only hierarchies can evolve efficiently and successfully in a consistently changing world. Simon's argument is not without criticisms, especially for imposing hierarchical organizations over markets. However, his emphasis on hierarchy as a structure to connect subsystems and supersystems in a complex system is well accepted in hierarchy theory. Indeed, reality may or may not be hierarchical, but a hierarchical structure facilitates observations and understanding. A complex system is more than simple aggregation of lots of little bits of information about individual entities. A good understanding of intrinsic relationships among parts and wholes (or individuals and groups) is necessary in the study of a middle-number complex system. In Simon's book entitled The Architecture of Complexity, published by MIT Press in 1969, Simon emphasized that hierarchy is profoundly natural and emerges through a wide variety of processes that drive the evolution of the system through self-organizing interactions and dependency among elementary units to reach stability and sustainability in the system. Dynamics is, hence, the working of these evolutionary processes and responses from elementary units, individually and collectively at various scales. At a lower level in a hierarchy, elementary units (or entities) operate at a higher degree of frequency (or have higher activity rates) but have a higher degree of variability than those at a higher level. A good example is climate and weather. Weather may be capricious within a day or over a few days, but climate variability is much lower than weather variability because a climate system corresponds to a longer-term pattern over a broader region. Nevertheless, elementary units and their associated processes in a subsystem (or at a lower level of the hierarchy) support unit activities and processes in its supersystem. Meanwhile, elementary units and associated processes of a supersystem constrain the bounds of activities and processes in its subsystems. A tropical climate zone sets the range of possibilities for weather systems to develop in the zone. In this context, scale is the function that relates elementary units and the interconnections of their behavior across levels of systems in a hierarchy. Recognition of their behavior and interconnection can facilitate identifying subsystems, their hierarchy, and the manifestation of dynamics at and across multiple scales. Now we can consider how dynamics may be embedded in a GIS. In the framework of general system theory and hierarchy theory, we need to consider wholes and parts and apply system concepts to develop GIS data models. We can start with a whole, then identify its parts. Alternatively, we can start with elementary units to recognize wholes. The concepts of aggregation and disaggregation apply well here. The use of aggregation and disaggregation tools is becoming more and more common in GIS analysis for upscaling and downscaling geospatial data from local to regional (such as spatial interpolation) or from global to regional (such as multivariate spatial allocation). What has not been common is to store the data objects and their associations across spatial and temporal scales in ways that correspond to the proper underlying processes. In addition, we should be attentive to additional properties that emerge through aggregation, not just grouping points, lines, or polygons together. Systems or objects formed by aggregation should be characterized with additional properties appropriately. For example, geospatial data and weather data observed from a severe storm system at a mesoscale can be linked to data representing seasonal patterns at a synoptic scale. A severe storm system has objects at several levels of granularity, from data bits of in situ ground observations to Geostationary Operational Environmental Satellite (GOES) images from a meteorological remote-sensing satellite. Aggregation of these data bits over space and time form a temporal sequence of footprints from a storm. In addition to data bits, each storm object has attributes of size, rate of movement, direction of movement, precipitation intensity, wind speeds, etc. Within each storm object, there are features signifying rotation, hail formation, downdrafts, etc. Each of these features is a data object at this scale and should be associated with proper attributes. Eventually, the spatiotemporal aggregation forms a narrative of the storm to characterize the storm development and lifeline. With the linkages to form hierarchies of synoptic weather systems and localized storm events, spatiotemporal analytical and computational tools can be developed to support queries and knowledge discovery about composition, organization, and interconnections among these super- and subsystems. For example, it will be possible to query synoptic weather systems associated with certain types or behaviors of local severe storm events. It is also possible to compare local severe storm events and evaluate synoptic conditions that promote or suppress their development. We will be able to mine data on higher-level concepts, like storms or lake-effect snow events, than data records or clusters. The approach can also enable linkages among systems across domains, such as weather systems and transportation systems, to allow information analysis that leads to new insights into and a closer understanding of the wholeness of reality. Hence, aggregation is more than just grouping objects over space and time but brings about higher-level geospatial objects with emergent properties and behavioral characteristics. Besides aggregation, there are processes of agglomeration and narration that can form abstract objects at a higher level in a system. The concept of agglomeration has been used mostly in reference to a metropolitan complex in which cities and towns are connected to form a greater urban area. While definitions of aggregates and agglomerates vary, it may be useful to consider that aggregates reference systems of individuals of the same type and agglomerates, systems of individuals of multiple types. For example, a flock of sheep is an aggregate, but an urban system is an agglomerate. If we can identify and formalize structures and functions that form aggregates and agglomerates, as well as model their behavior, we can incorporate these structures, functions, and behavior models into GIS to automate the processes of forming aggregates and agglomerates. Subsequently, we can model their behavior and analyze the constraints that they pose to objects at a lower level, as well as their support of (or influence on) objects at a higher level in the associated hierarchy. In contrast to aggregation and agglomeration, narration produces narratives that play out a story in space and time. A narrative system connects geospatial lifelines via spatial and temporal markers to tell us what has happened, how it happened, and what could have happened. Constructing narratives from spatial and temporal data is very challenging, but its potential for understanding dynamics cannot be underestimated. Storytelling is said to be one of the most effective ways of learning, sense making, and communication, and some consider humans the only species with the intelligence to construct narratives. Regardless of the validity of these claims, mapsas the most popular communication means of geographic informationcan be greatly enriched with narratives (perhaps semiotic forms) to add dynamics that shape reality. When a GIS is able to capture and handle information about geographic dynamics, we are empowered to study the world not just spatially or temporally but holistically from a system's perspective. A dynamics GIS needs to make the connections across multiple themes and scales through spatiotemporal integration and summarize discourses and mechanisms by which dynamics manifest and narratives unfold. Think about a GIS not only to show where things are but how geographies become. Dr. May Yuan is associate dean and Edith Kinney Gaylord Presidential professor at the College of Atmospheric and Geographic Sciences, University of Oklahoma, Norman, Oklahoma, and director of the Center for Spatial Analysis. She is author (with K. Stewart) of Computation and Visualization for the Understanding of Dynamics in Geographic Domains: A Research Agenda (2008, CRC/Taylor and Francis) and editor (with K. Stewart) of Understanding Dynamics in Geographic Domains (2008, CRC/Taylor and Francis). Her primary research area is the representation of dynamic geographic phenomena in support of spatiotemporal query, analysis, and modeling. For more information, contact May Yuan (e-mail: myuan@ou.edu).